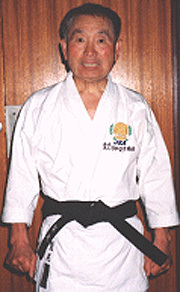 Yoshikazu Sumi Shihan was born in Shiritori Japan on the 23rd June 1936. He started his practice of karate at the age of 18 years at Keai college and his first teacher was Sensei Takaura. He graded to Shodan (1st dan) in 1957. Sensei Sumi taught karate on a US airforce base in Japan and in 1962 joined the Japan Karate Association. Sensei Sumi still lives in Shiritori Japan, he is the official Head of the Karate Union of Australia and The School of Traditional Karate UK.